Today, we are officially excited. Why? Because we can proudly announce that Future Publishing and its all-conquering (ahem) Music-Making portfolio - MusicRadar (that's us), Guitarist, Computer Music, Total Guitar, Rhythm, Future Music and Guitar Techniques - has signed a deal with the Music Industries Association (MIA) to run the London Music Show for 2010. London Music Show 2010 takes place on 8 - 10 October and will once again be held at London's ExCel Arena. Formerly known as the London International Music Show (you might remember last year's stellar coverage of new gear, rock star performances and show floor shenanigans), this year's show will incorporate Drummer Live, London Guitar Show and the Sound Recording Technology Show with an emphasis on allowing visitors to try out new gear and get involved. There will also be a special education day on Friday 8 October and, by popular demand, the retail area will be brought inside the main event. "We are very excited about this partnership with the MIA to run the London Music Show, and our objective is to invest into this event for long term growth. "There is huge potential for the London Music Show to reach a wider audience, whilst increasing its links with education by encouraging beginners to start playing musical instruments. We are delighted to add the London Music Show to our portfolio, and we look forward to bringing our expertise to this event." "There are 15 million people in the UK who would like to start playing an instrument, or return to playing one. That is more than actually DO play! We needed a partner who could help us to reach these people and give our industry a show that would truly increase the size of our market place. "Our show needed to stop 'preaching to the converted' and instead, to offer an event that inspires everyone to want to start making music. Future are, without doubt, the people to help us realise this vision and we are very proud to have them as our partner." All this with added MusicRadar magic, of course. Working with the MIA, we'll be doing our very best to bring you the latest and greatest gear, stars and events around - we'll be there in force. We'll be covering every nano-second here on MusicRadar plus you can head over to the official London Music Show 2010 site and pop in your email address for the latest announcements. 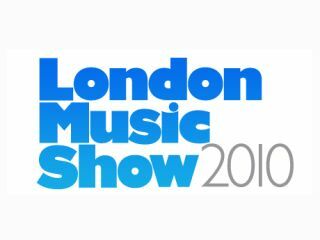 The LMS site will be given a complete makeover in the coming months - just sign-up or follow @LondonMusicShow on Twitter for up-to-the-minute updates. Much more to follow. Much, much more. Did we say we were excited yet?